I’ve written about the glory of microbes and compost in the past and I highly recommend the read. I hold fast to what I wrote six years ago at the Laurel Valley garden: “Whether or not we want to admit it, our lives are utterly dependent on the poop and corpses of a bunch of invisible life forms. What a way to make us feel truly human: humble, lowly, of the ground.” That experience involved a relatively small pile at the top of the garden, carefully hand-turned by yours truly, maggots and worms and all the invisible magic-makers slung with a pitchfork into a newly mixed pile that started cooking and shrinking within a few days. At the Youth Farm, we take a different approach to compost. It’s more massive but less involved, which I find exhilarating. Compost can be exhilarating, you ask? Of course! Especially when you’re making it with a tractor, speeding back and forth down the driveway with a steaming bucketful of cow manure wafting straight into your face. (Okay, that wasn’t my favorite part, but it was definitely kept me awake…) A few volunteers commented how they couldn’t bring themselves to interrupt my process because I looked so content and focused— and they were right. Making compost keeps me in the flow: it’s creative, it’s visibly satisfying, it’s challenging, it’s time consuming. And at the end of it all I get to admire not one but two beautifully constructed piles of farm compost and cow manure. Start a debris pile. We call this the “compost pile,” but it’s really just a staging pile for plant material. This year, it got so dry and we waited so long that much of this normally-nitrogen-rich material became desiccated and carbon-rich instead. Not ideal, but it just meant some tweaking of ratios when it came time to construct the pile. Gather leaves, manure, straw, and whatever else you want in the pile. We get leaves donated from Springfield’s leaf pick-up service. Our manure comes from a local dairy in two giant truckloads every fall. Straw comes off the garlic beds in July and we buy in more to cover the new ones in November. Spread a bed of insulation in the space and shape you want the pile. This year I used the giant knot of winter squash vines that we deposited separately from the debris pile. Straw’s a great alternative. Layer. Green and fresh debris (everything from cabbage peels to rotting tomatoes to old strawberry plants), then leaves or straw, then a healthy dose of manure. Adjust the amount of leaves and straw depending on how desiccated the debris materials are. Add water as you go if it’s dry. Repeat. I’m a finicky pile maker and try to get the layers relatively even and uniform, but at a certain point I just have to let go and remember that it’s all going to get digested anyway. No point being too picky about it. Once all the debris is transferred to the new pile (which can take a while, and involves a lot of moving, but it’s still one step), top it off with more manure and then a coat of leaves. Cover from the rain with old plastic or tarps— otherwise nutrients will get flushed down and out of the pile. Wait, and watch it shrink. If you want to get technical, have concerns about pathogens, or need to keep records for certifications, take the temperature on a regular basis. It should reach 140-160 degrees Fahrenheit within a few days of building or turning. Turn it! This is the step that gets most neglected by both us and home gardeners. Turning it re-ignites the decomposition process by bringing cooler, undigested materials from the outer edges of the pile into the hotter, active core of the pile. It needs to happen at least a couple times. But the beautiful thing is that if it doesn’t, the world isn’t going to implode. The pile will just sit there, hangin’, until you get around to turning it. The more turning, the more aerobic and faster the process will be, but slow is fine too. So no sweat. Use it. We usually spread our compost on beds in the early summer when we’re at maximum youth farmer capacity. Ten wheelbarrows and shovels (or if we’re in a pinch, tractor bucket and a couple shovels) do the job. Just a half inch layer, tilled in, is enough to boost fertility for a short crop. 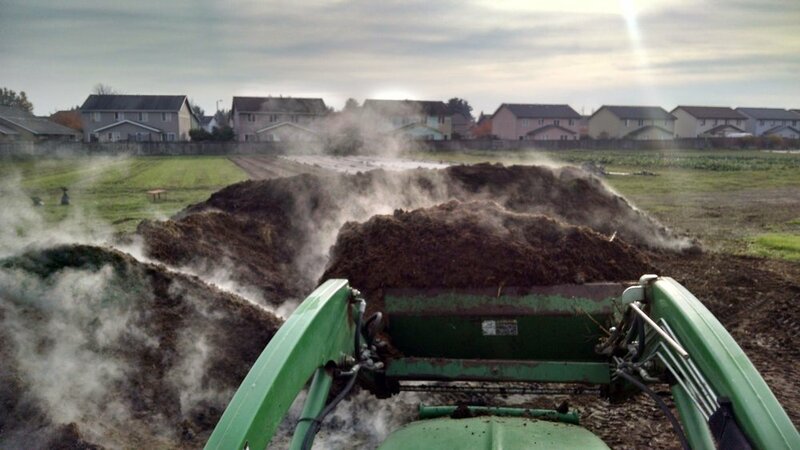 The same process goes for the manure as well, except that it’s all manure rather than different layered materials. When I shaped the dump loads into one large, neat windrow this week, it was steaming so profusely that I had to strategize to keep myself upwind of it just to be able to see what I was doing. It reminded me of a lava cake with dry ice floating from its top. A farmer’s birthday dream!